For a long time the sparkling wine was called Xampàn (Champán). Son Manuel Raventós took over in 1885 the leadership of the company. 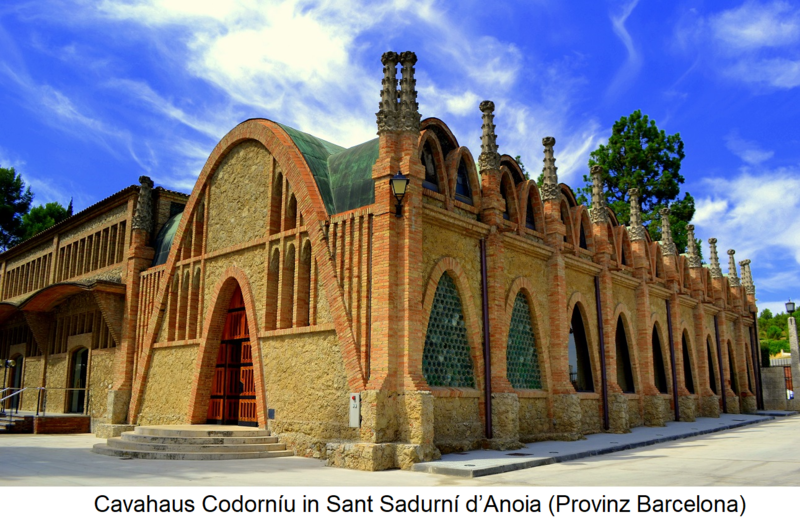 At the 1888 World Fair in Barcelona, Codorniú sparkling wine was awarded a gold medal. From the year 1897 an export took place, since this year the royal coat of arms on the label appear. Built in 1915, this five-storey wine cellar, listed since 1976, has a 30-kilometer labyrinth and is surrounded by a beautiful park. The old bodega has been converted into a museum. The standard cava of the house is made from the three classic varieties Parellada. Macabeo and Xarello produced. Furthermore, also Cavas with Chardonnay Shares generated, these are "Codorníu 1551", "Anna de Codorníu" and the top reserve "Jaume Codorníu". Codorníu sat in the early 1990s against the vehement resistance of its big competitor Freixenet the authorization of the Chardonnay variety. Codorníu was the first machine in the 1970s remuage (Shaking) of the bottles by means of Gyropalette used. In 2001, 450 years of company history were celebrated. The Spanish King Juan Carlos I (born 1938) visited the Codorníu winery and put his autograph on the label of the bottle, which has been given the name "Gran CAVIT Primato" and holds 26 liters. With just under 100 million bottles a year, the company is the second largest cava producer after Freixenet. But it also produces large quantities of still wines. The company includes many other companies. Already in 1914 Manuel Raventós became the famous winery raimat founded. Furthermore, the wineries Masía Bach and Rondel belong to the company in the area Penedès, the winery Bilbaínas in the Rioja Alta area, as well as its own viticulture research station. In Los Carneros In California, the Codorníu Napa winery was opened in 1992, where sparkling wines are produced. This page was last modified at 3 March 2019 at 18:25.